This looks fun! I just love your giveaways! This movie looks adorable and my girls can not wait to see it. And they LOVE reading, they would adore these books! I think this movie looks funny too! My kids love that he poops jelly beans. I love video, very cute rabbit! Nice prize and just in time for Easter. know the perfect little boy to give this to! We're so looking forward to seeing the movie! Thanks for the chance to win the books. My oldest is nervous during any suspense, even in a cartoon movie, so we're always looking out for something fun and appropriate - hoping we can enjoy this one! I would love to win these books to use in my preschool classroom. It would turn my book nook into a very popular place! Thanks for the chance to win. I subscribe to your newsletter and I follow via GFC! Sounds like a great movie! Thanks for offering the giveaway. My favorite Easter book is The Story of the Easter Bunny by Sheila Black. Wow these books look as fun as the movie does! I love to read to my little grandson. These books look bright and colorful and would hold his interest. All the books sound great. 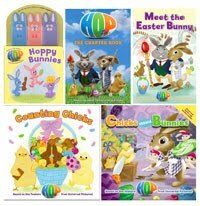 I bet my kids would enjoy HOP: Meet the Easter Bunny since they are both early readers. All my daughter talks about is seeing Hop. She'd love the price package. 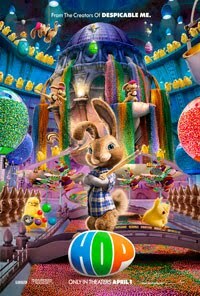 My daughter laughs about the part where The Easter bunny poops jelly beans. LOL. My girls would love all of these books, what a wonderful giveaway and would be perfect for Easter. Thanks so much for the chance! We left the movie theater after this one with my little guy begging for candy. Luckily I convinced him he'd have to wait for the Easter bunny to come before he got any candy! Our family is looking forward to see this movie. My granddaughters would love these books! My kids are excited to see this movie and these books look fun to read. Thanks. Looks like a wonderful movie for the family to enjoy. I would love these for my prereaders storytime groups. Thanks for the contest. My daughter would be thrilled to find these books in her Easter basket! I think the movie looks super cute and I love reading books to my daughter so I would love to win them for her. My normally scardy cat daughter is really excited about this movie and actually wants us to take her to it at the theater! I'm excited, it'll only be her second movie ever. She has looked at Meet the Easter Bunny at Borders a couple of times and I think whether or not we win that's going to hop it's way into her Easter basket. Following you on Twitter, @KTnestingspot. Here's a link to my tweet: http://twitter.com/#!/KTnestingspot/status/53884125567926272 that was also posted on FB page. Would love to win. I think my daughter will love them, especially the finger puppet one. I love the range of ages covered by this book selection! This looks like such a cute movie and I'm sure the books are great as well. The grandkids are going to see Hop tomorrow & this book collection has books for each of their reading levels - great! This movie looks too cute. My granddaughter wants to see it and would love to have the books. My 5 year old granddaughter laughs every time she sees the commercial for this movie! These books are so cute. We loved the movie and I know my daughter would love the books! My two want to see this movie. I think the books would be great in an easter basket. Great for lots of ages too. I watch 2 babies during the week while mine are in school and there is a book for all the ages. Nice! My kids would love to read these books. I think we are going to see the movie this weekend. Just in time for Easter! Books and movie! These would be fun to share with my children! we wanna see the movie HOP! We are so excited to see the movie soon. The books look adorable too! This looks like such a cute movie. My kids really want to see it! I would love to have these to read to my son and daughter. We loved the movie hop. I am a subscriber. Thanks. We could also use some new books. I can't wait to see this movie. I think my daughter would love these books. She's a little obsessed with the Easter Bunny right now.